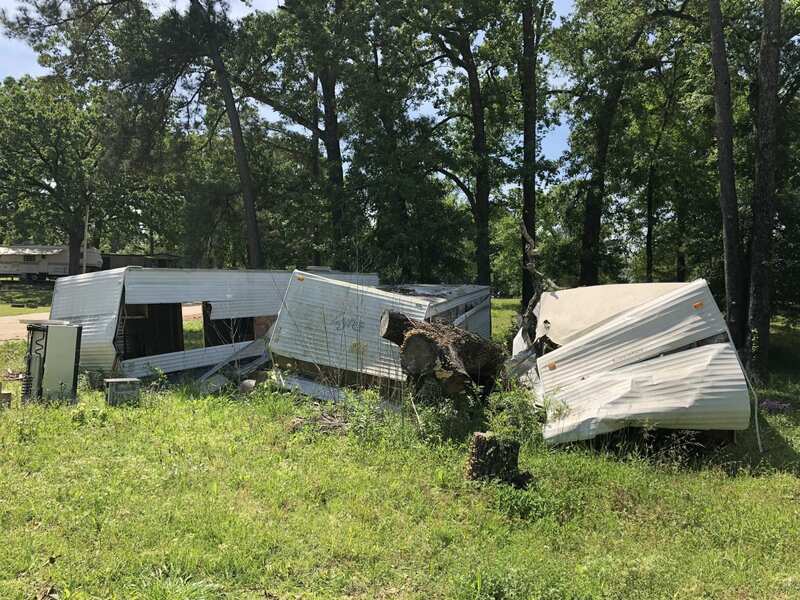 While cleanup from the April 14 tornado nears an end in most areas, the Hill Crest Mobile Home and RV Park in Haughton remains a frightening sight. Several trees have been sectioned into manageable sizes and stacked in heaps throughout the looping dirt road, but the remainder appears ignored and an unsettling reminder of nature’s power. Across from the small empty plots of land remained several ruinedRVs. Appliances littered the ground and large sections of the vehicles were torn off, exposing the demolished living areas. Other still had heavy trees embedded into crushed roofs. The park was founded in the mid-1970s. A hired manager handles the upkeep and general oversight of the RV park but was unavailable for comment. When the tornado ripped through the park early that morning, it collapsed a tree onto a RV where small children were asleep, tragically taking the life of 20-month-old Carli Ortiz. The Ortiz trailer was removed on Wednesday, April 18. According to a friend of the Ortiz family who also asked to withhold her name, they were planning on going to another family member’s house due to the strong winds and were trying to get to the children when a tree collapsed onto the roof and trapped the little girls. The younger of the two was rescued with minimal injury. “When it happened, they were getting ready to go to the brother’s house because the storm was getting bad. When they tried to grab the baby is when it happened, so they saw that,” the friend said. The parents of Carli are associated with horse racing and that is what brought them to Haughton two weeks prior to the storm. When asked how the parents were doing now, she shrugged and said only that they were starting to eat a little bit, and that Mr. Ortiz has not yet returned to work. The funeral services for Carli were donated by Hill Crest Memorial Funeral Home on US-80 in Haughton on April 17. Donations for Carli’s family on GoFundMe.com have met their goal but are still graciously accepting donations. The Ortiz’s pastor, Jimmy Sistrunk, says that people may also donate through the Winner’s Circle Church at the racetrack via Don Simmington or through Winner’s Circle Church Ortiz Family Benevolence Fund whose information can be found on the church’s Facebook page.